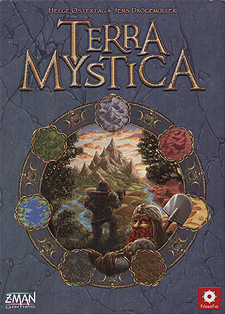 Terra Mystica is a strategy game with a simple game principle and very little luck involved: You govern one of 14 factions trying to transform the landscape on the game board in your favour in order to build your structures. On the one hand, proximity to other players limits your options for further expansion, on the other hand though, it provides some benefits during the game. This conflict is the source of Terra Mystica's appeal. Structures may be upgraded to provide even more resources, like workers, priests, money, and power. Build temples to gain more influence in the four cults of fire, water, earth, and air. Build your stronghold to activate your faction's special ability. Expand and build new dwellings to have many workers at hand. Or make sure to have a constant flow of money by building trading houses. The 14 artfully designed factions, each having unique special abilities, as well as the exchangeable bonus cards allow for a large number of possible game plays that constantly keep this game entertaining. This slightly more complicated game than most and whilst the explanation was necessarily longer once we got down to playing it all started to make sense after the first round or two. Players are controlling races trying to build cities as well as building up status in various cults, each race has its own unique abilities and bonuses. Each player has their own board which controls all aspects of their game which is quite neat. Each round their is a specific goal which will earn you bonus VP`s, each race has to build on certain terrain so the first order of business is to terraform the landscape in order to build your city. I really enjoyed this, it is not a short game but the time passes by without you really noticing as you concentrate on your plans. There is plenty of player interaction, some of which involve actually helping other players to score whilst furthering your own efforts. It is not an easy game to summarise but it is great fun and a challenge to play and I look forward to trying this again with a different race.